One of the most famous movie cars in the world, the original DeLorean Time Machine from Back To The Future, gets the restoration it deserves in a new documentary film. OUTATIME: Saving The DeLorean Time Machine chronicles the story of the "A car" used during the main filming of the movie and it's deterioration after decades of harsh weather, souvenir hunters, wild animals, and countless display events. This cinema icon seemed destined for the junkyard, but in 2012, co-writer/producer Bob Gale urged Universal Studios to restore the car to it's original glory. I was lucky to be contacted by Virgin Films ahead of the official Blu-ray release (which was July 19) and prescreen the film. Those of you who ordered the new Back To The Future 30th Anniversary Blu-ray Boxset actually already own a copy of this film. But fans who perhaps previously owned the trilogy and passed on the 30th Anniversary Boxset can now own a separate Blu-ray or digital copy of the film including bonus content. I live for documentary films on retro pop culture exactly like OUTATIME. In fact, I found a similar short documentary featuring the restoration of the original Ecto-1 on YouTube a few years ago and absolutely loved the care and detail taken to preserve an important artifact from our era. OUTATIME interviews the people who truly cared about preserving the one true original DeLorean Time Machine and does an excellent job of telling their story. And while the film mostly details a car restoration, it's really fun to hear the relationship it has had with the filmmakers, amusement park staff, and fans throughout the years. A must watch for Back To The Future fans everywhere. 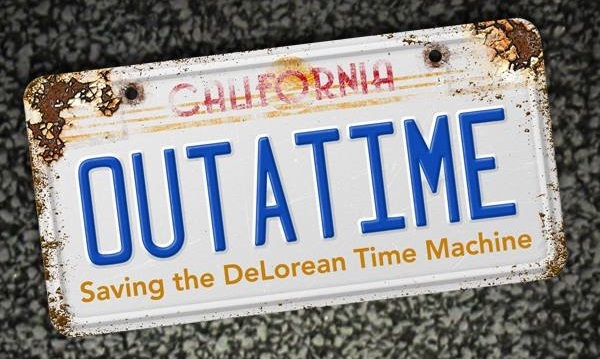 Find OUTATIME: Saving The DeLorean Time Machine now on Amazon and iTunes. You can also go to the film's official store for official posters, license plates, and more.